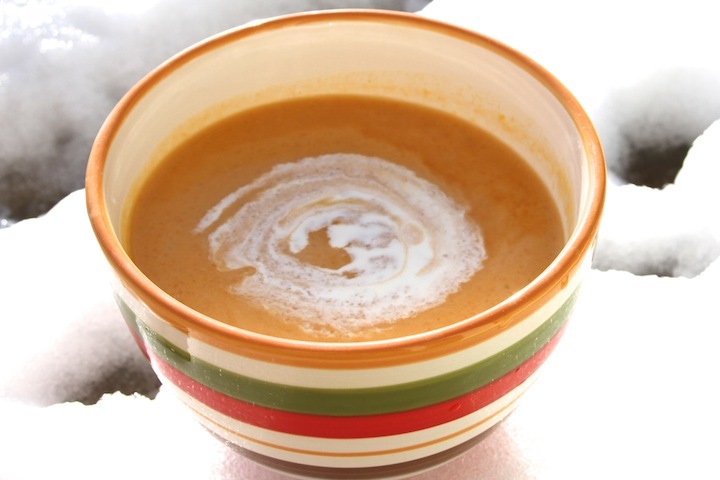 The weather is warming up, but I promised my Butternut Squash recipe. Hopefully, there is a cold day lingering before spring is in full bloom. Otherwise, save this post for Winter 2013! 1. Chop the onion and squash. 2. Add the chopped onion and butter to a saucepan large enough to fit all the ingredients. Cook on medium heat until the onion in translucent. 3. Add cubed butternut squash and 1 1/2 cups of chicken stock to the saucepan. 4. Simmer until the butternut squash is tender. About 15-20 minutes. 5. Remove from heat and spoon into a blender. Pureé the squash, onions and stock, then add the heavy cream. Add extra stock if needed. 6. Add salt and pepper to taste and enjoy!It is so easy, and so delicious! Sorry for the long hiatus! This past week my beautiful sister, Melanie, got married to the love of her life, in Aruba! Then Thanksgiving break came, so I’ve been in vacation mode for a while. But I’m back and I’m making things. I am always looking for new recipes on blogs or Food Gawker and when I find one I like I bookmark it and then forget about it. 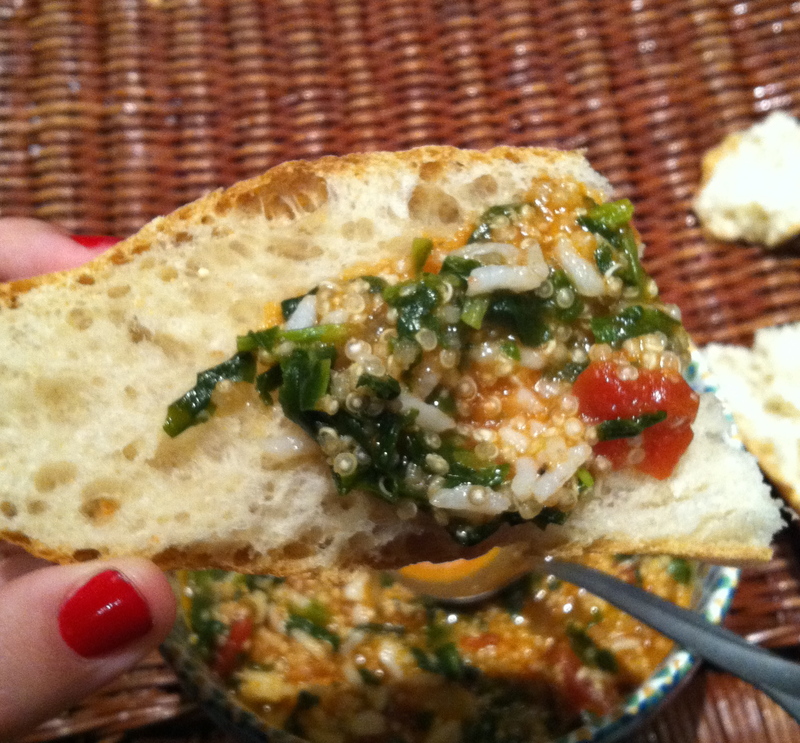 But I’m starting to go through them and found this recipe for Tomato Florentine Soup, which I made for dinner tonight. I’m not very good at throwing things together and making it taste good, so I used this recipe from Good Life Eats and changed a few things around. I omitted the garlic, because I don’t like eating it if there is even a 2% chance of me going out or seeing anyone. I also swapped the penne with some white rice I had left over from the night before. I also added quinoa, which I finally picked up off the grocery store shelf. And finally because I’m just me, a little bean, I cut the recipe into a 3rd. Either recipe you choose to make this recipe, I’m sure it’ll make you all warm and cozy when you make it this winter! 1. Heat butter and olive oil over medium heat and add the onion. 3. 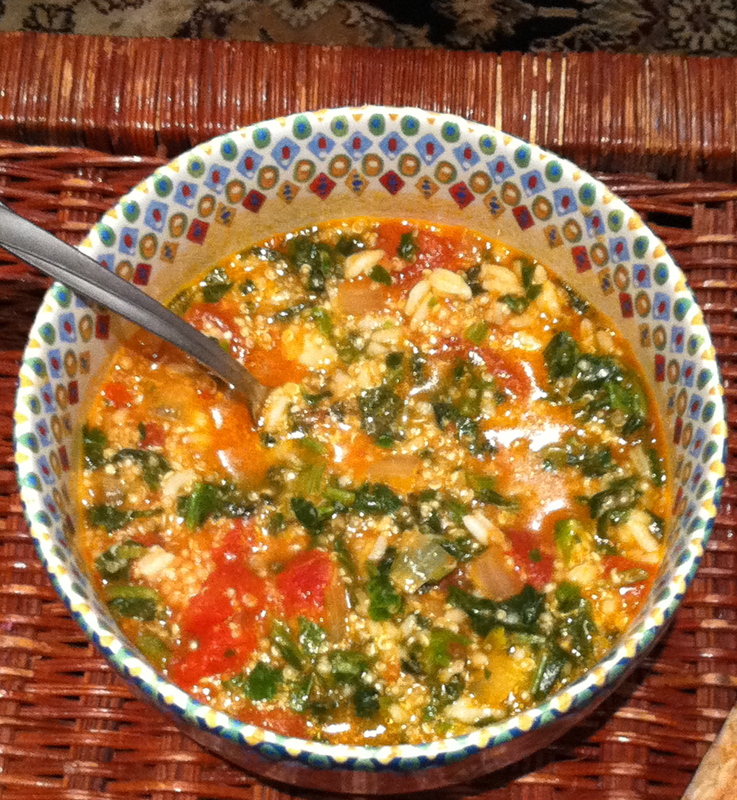 While tomatoes are cooking, cook the quinoa in 1 cup boiling water for about 10-12 minutes. 4. Stir the flour into the tomatoes, then add the tomato juice and bay leaf. 5. Add the quinoa and the can of broth and stir. Bring to a boil, then simmer for 10 minutes. 6. Turn off heat, remove bay leaf and add rice, spinach, cheese and balsamic vinegar. Add salt and pepper to taste. Serve and enjoy with warmed french baguette.